SUNSET CALL: MOTH MIKE ADRAIN. National Treasurer. It was in this position that the MOTH benefited the most, where his professionalism and diligence did the Order proud. It was only ill health that caused Moth Mike to retire from the Post at the end of 2017. In recognition of his outstanding service over many years, Moth Adrain was installed as Old Bill of the Order for the year 2015/2016. On behalf of all Moths, we pass our condolences to his wife, Diana, and their family. He will be sorely missed by all who knew him. The service will be of standard MOTH format, within the usual religious ceremony. Moth Norman Edwards will officiate and he has all necessary logistics in hand. To Di and the family – I would just like you to know that I am deeply honoured to have been asked to execute the MOTH segment of this service to Michael. By way of introduction, Michael and I go back a long way – from the time our now middle aged kids were at primary school – to a number of years together in a very active Round Table – to our many years association in the military and almost 30 years together in the Shellhole. Towards the end of the nineteen eighties, I found Michael wandering around in no man’s land so to speak, and persuaded him to join the Shellhole. He was subsequently inducted into Winston Churchill Shellhole in June of 1989. This was at a time when there were very few so called “Border Boys’ in Shellholes and a couple of years after his induction, we dropped him in the deep end and he became the first, non 2nd World War, Old Bill of the Shellhole. After serving as OB for 3 years I took over from him and when our then Paybill left on transfer around 1994, I asked Michael to take up the position – he did and he remained in this position until he stood down a couple of months ago. In the 90’s when I was at a GHQ meeting, the existing at the time, National Treasurer announced he was going to stand down and we were all asked if we knew of someone who could fill the position. I suggested they approach Michael and he duly became the National Treasurer in 2000 – in other words he held that position for almost 18 long years! If one thinks the position of National Treasurer was an easy task – think again. Every year Michael had to collate the annual financial returns of the Moth Office, GHQ, Warriors Gate, various Trusts and Bursary funds, returns from all the Provinces and their sub and sub-sub units plus from just over 200 shellholes. One can just imagine what a monumental task it was for him to collate all this financial data, have it audited and be ready to present a set of financials at the November GHQ meeting every year. Oh, and on top of all that, he was our official contact with SARS and after many frustrating trips to Pretoria, finally arranged a deal which has saved the Order a lot of money. “This certificate is the highest award in the MOTH and is presented to Moths whose loyalty and devotion to the Order has been outstanding over a considerable period and in a sphere wider than their Shellhole” This was a well deserved award. 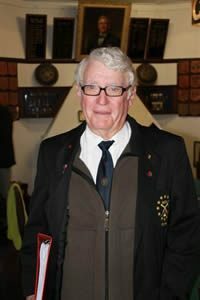 In 2015 at the November GHQ Meeting he was made Old Bill of the Order for the period 2015/2016 – an honorary position appointed annually by the full National Executive – a singular honour awarded to Moths who have served the order with distinction. Michael was one of those gifted fellows, who could listen quietly to both sides of a discussion and when everyone had had their say, would sum up the situation and give advice, which would normally be accepted by both sides of the argument – in other words he was one of those practical down to earth people who could see the wood from the trees. He did not suffer fools easily, and, at times – if required- could be quite direct, but this was always tempered with his sharp wit and lovely dry sense of humour. Michael was at all times a thorough gentleman who set an example to those around him and we thank him and Di for the wonderful support they gave to both the Order and the Shellhole over many years. Hamba Kahle Michael – we will remember you.